EMMANDUS INSPIRATIONAL NETWORK! : WHAT IS YOUR NAME? I come from a rich African culture where much importance is attached to a name. This practice is indeed true in every sense, even in most parts of the world. We are taking a close look into the nature of names as an important part of the success equation. If words are powerful then It’s only logical for me to believe that names are much more powerful. As a matter of fact, In my opinion your name will be mentioned or used about a billion times in your life time and probably beyond. A name has the capacity to outlive you. What makes names special? What is so spectacular and amazing about names? I will shed some light on some today by God’s grace. This is mind blowing! I will try to get to it as easily as possible. A name connotes beginning. A name is a hallmark of every meaningful beginning. Imagine boarding a plane/flight with no name at the beginning of a journey to nowhere, Imagine sitting at the cinema to watch a movie without a title, you would rarely start to read a book without a title or author, every huge project as a scope a name a title. Even a baby at the beginning of its life gets a name that marks the beginning of a journey to person hood. A name is your first priced asset in life. Think about it, no great business enterprise or organization takes off without uniquely defined name apart from it s vision and mission. The first asset a baby receives in life is its name, there even a whole of websites that specialise in helping young parents with this choice. I love pets especially dogs. Have you ever imagined what happens the moment you give a dog its name and it goes on to own it and answer that name? Names aren’t just words, even Yachts or Hurricanes have names... So I would like to reflect more on the nature of names. Your name is your identity and a reflection of your attributes and personality. When a name is mentioned, something comes to mind, it might be closely associated with a problem or a solution. Your name is like a huge label around your brand. If you were a product your name is one of the way you appeal to customers, it might be a reason people buy you. Your name creates an impression on people. Often times our names create an atmosphere, feeling or mood wherever they are mentioned. See how many times some names are mentioned and someone smiles or frowns. Your name is an entity and integral part of your identity. Your name is your brand. If you are in double Google brands like Coca-cola, Microsoft, IBM, Xerox to Tiger Woods, Giorgio Armani (Hah! I won’t delve much into the subject of branding here). Your name tells people something about you. Your name might tell us where you are coming from, where you are or perhaps where you are going. 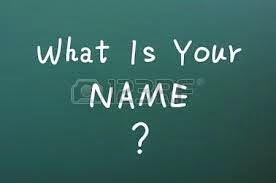 A name as your identity can tell us a bit of whom you are or perhaps something about you. A name can tell your story. Name means access. Your name is the first point of contact with you. People know your name first before they ever get to know you. Most times they see you before they might be opportune to hear you and what comes to every one’s mind consciously or subconsciously is always one question- WHAT IS YOUR NAME?? – Who are you? Your name is people’s first access to you because that is what you answer and most likely that is what they already have. I have a list and some pictures of mentors on my goal pad/ vision board some I have never met while some I have already met yet I have never met any of these great minds without at least knowledge of their names.If according to Robert C. Lee “The sweetest sound to anyone's ears is the sounds of his own name” then I also discover people’s name will make different music to the m based on the level of access or relationship you have with them. However people’s name most times will be your first access to them. Names also create access. Have you ever had an appointment with an executive without knowing his name? Probably not. If you were in a great place and you were scheduled for an appointment, you will most likely be asked who you want to see. And the name creates a level of access for you. Just like a busy executive that wouldn’t be disturbed in the midst of a meeting but on hearing the voice of his son call out ‘Dad’ or the voice of the wife call out ‘Bill’ will excuse himself for few minutes to answer his name or the call. What is your name? We have heard this question countless times and behind those words are the vital questions ‘who are you?’ or ‘what is your story?’. Names aren’t just words. A name is a vital part of your identity, it has a life of its own – it doesn’t die depending on how you use it or what you do with it and it creates the first level of access to you. In W. C Fields' Words, “It ain't what they call you, it's what you answer to.” and I might add that what you call yourself and what you answer to, matters a whole lot on your Journey to Greatness. I will love to read your thoughts on this subject in the comments section below. My name is Emmanuel Ayeni.